Potato salad, reimagined with refreshing Spring ingredients! 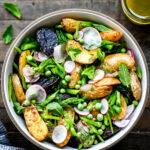 Roasted fingerling potatoes, asparagus, peas, radishes, and a lemon dill vinaigrette: the perfect light side dish. Preheat oven to 375 F and bring a large pot of water to a boil with about 2 tsp salt. Add potatoes to boiling water, reduce heat to a simmer and let cook 15 minutes. Drain potatoes thoroughly and spread out on cutting board. Let cool for 5 minutes. Slice potatoes in half and toss in olive oil and salt. Spread evenly on a sheet pan and transfer to oven. Roast until crispy, about 23-25 minutes, stirring gently halfway through roasting. In the meantime, heat water to steam asparagus. Steam asparagus for about 3 minutes, until just tender, then plunge into ice water for 1 minute to cool down. Drain and set aside. Prep remaining vegetables and add to a large bowl with asparagus. Whisk all ingredients together to make vinaigrette. Taste and adjust as needed. When potatoes are finished, let cool for a few minutes, then add to bowl with other vegetables. Add about half of the dressing and toss well. Add more dressing as desired – we usually add a bit more just before serving. Don’t be afraid to heavily salt the water while boiling the potatoes! It adds a ton of flavor, and the extra salt is discarded when you drain the potatoes.